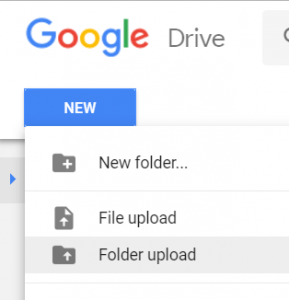 Campbell Commons » Uncategorized » Students: Back Up your files to Google Drive! On a school computer, open http:\\drive.google.com and log in with your Campbellhigh.net Google Account. In Google Drive, click New, then click Folder Upload. Select your network drive (Look under “Computer” and find your student ID number. ), then click OK.
That’s it! You should see your files being uploaded to Google Drive! If you have any problems, ask the Campbell Commons staff for help.